A VPN in short, is pretty much a ‘tool’ which can protect your privacy & allow you to use the internet anonymously. Using a VPN with Kodi is not really a requirement, as the third party addons in Kodi use standard HTTP protocols, and not torrents or P2P based streaming. However, it may interest you to use a VPN in general, if you wish to protect your privacy – as a new law has been passed that allows your (Australian) Internet Service Provider to log and retain your metadata. There is however an interesting article on GIZMODO that you can read by clicking here. It aims to show that the new law is not as scary as it seems, and there is nothing different about the past and the present with this new law, other than your Internet Service Provider having to hold the metadata logs for 2 years (where in the past, there was no requirement to hold the information). The new law does not indicate logging a users web browsing history, so that’s good news.. Nevertheless, it is quite scary to know that there are eyes watching your every move, even in the privacy of your own home. Another advantage of using a VPN or Smart DNS (we will explain the difference between these below) is that you can effectively ‘change’ your location to unlock geo-restricted content. For example, there may be some Free to Air Channels in Greece, Italy, UK etc which are freely available to watch via the Official sources. Most VPN’s & Smart DNS services support unlimited switching servers capabilities, so you can change your location in a tap of a button depending on the content you wish to watch. This also comes in handy for expats (people living abroad). Lets just say you are Australian, but have now moved to (example country) for work. Using a VPN or Smart DNS, you can allow yourself to use ABC iView, 9now, 10Play & other aussie catchup / live content which is usually restricted to Australia. Is using a VPN or Smart DNS Legal or Illegal in Australia? Using a VPN or Smart DNS to bypass geo-restrictions or other legitimate purposes is totally legal! This is how companies such as ‘GetFlix‘ are able to operate and allow users from other countries to access the American version of Netflix. What is the difference between a ‘VPN’ and a ‘Smart DNS’? A VPN is an extension of your network where your internet traffic is encrypted and tunneled through remote servers. This in return, changes your original IP address and replaces it with the IP address of the VPN server. When you go on the internet, companies, governments & your ISP (internet service provider) monitor your activity and collect data and information about your online activities. Companies do this to target you with personalised ads, while your ISP / governments do this as a routine procedure for security purposes. A VPN is best described as a tunnel between you and the open internet, protecting you from prying eyes. A VPN service will help keep your private online activities confidential, just like a security guard protects a premises from unwanted persons. Note: Not all VPN’s are the same, and we’ll help to explain that in the ‘choosing the Best VPN provider’ section below. Secures your privacy and masks your true IP Address. Blocks companies from building ‘profiles’ about you, based on your online activities. Provides anonymity over the internet. Protects your data by encrypting it and keeping you safe from cyber criminals. Bypass local ISP based blocked websites, allowing you complete access to the public internet. This may also benefit some KODI Addons that search the web for streams. Some third party Kodi Addons search the web for streams. The sites they search may or may not be in the block list > if the addons rely on sites which are indeed in the block list > then the result will be that you will have less streams/hosts available to choose from for various Kodi Addons (some addons may entirely stop working). There may be legal addons which search one of the hundreds of blocked sites, which is why we are providing this information to you (we don’t encourage or support the use of third party addons which provide copyright material). *remember to “clear cache” on any kodi addon that you want to use after activating your VPN. Some addons will store a ‘cache’ copy of ‘dead sites’ so that they wont waste time searching them again. Multiple servers allow you to switch your location & IP address at any time, also allowing you to unblock geo-restricted websites & content. Easily switch between hundreds of VPN servers. Kill switch* available with most privacy based VPN providers – this ensures that if you happen to disconnect from the VPN server, the app will automatically kill your internet until it re-connects to the VPN server. This ensures you are not accidentally compromised by temporarily switching back to your normal internet. Easy to use across all platforms with apps available for every device. Slows down your internet speeds. No matter the marketing, every VPN service WILL slow down your internet speeds. This is due to the fact that VPN’s encrypt your traffic, and this takes longer than simply accessing content directly, without a tunnel in the middle. The good news is that this is only particularly noticeable in online browsing, however, when streaming or downloading, a drop of speed is not usually noticeable – in some cases, you may find that your download speeds are faster with the VPN (due to the fact that you are connecting to a VPN server which is closer to the downloads location). Doesn’t work with NetFlix (and possibly some other geo-blocked services). NetFlix & some other services hunt down and block the IP Addresses of known VPN’s, in order to make it harder for you to access their content which is restricted to specific parts of the world. You may find that the VPN provider actively tries to work around the blocks by changing IP Addresses, however, it’s only a matter of time before they get blocked again. A SmartDNS only routes certain pieces of your internet traffic through its own proxy servers. This way the blocked websites receives the authentication information for validating your location and allows you to access it no matter where you are located. It works faster, due to the fact that it does not provide ‘encryption’ or anonymity. Does not affect your internet speeds. Allows you to unblock geo-restricted content more efficiently, without compromising your internet speeds. GetFlix SmartDNS works better for NetFlix & other geo-restricted services. Does not offer anonymity, encryption or online security. Not all SmartDNS providers provide exclusive, easy to use apps. Setup process is longer & more complex. May be difficult to set-up for some users. Choosing between a ‘VPN’ and a ‘Smart DNS’? Your decision should be based on what you require. If you primarily want to access the American version of NetFlix, Hulu, BBC iPlayer, or other mainstream geo-restricted streaming services – with no other intentions, then a SmartDNS is what you require – specifically, GetFlix. If you primarily want to access blocked or geo-restricted websites, with the addition of browsing the internet anonymously, switching servers/locations/IP Addresses – then a VPN is what you require. A VPN will also provide the ability to do what a SmartDNS does – however, as mentioned above, a SmartDNS has one purpose – which is why it performs better for that specific purpose. A VPN can be considered as an easier to use, all-rounder – with other advantages. If you’ve heard about VPN’s or read about them in the past, and are now looking to take that next step of using one – it’s very important to choose the right provider. I mean, what’s the purpose of using a VPN provider which logs traffic or doesn’t encrypt your traffic (the same as your ISP), and can pass those details on to whoever requests them? So the first thing is to choose a provider which does not keep traffic logs. You also want to choose a provider who has FAST/MULTIPLE SERVERS (you need to be aware that using a VPN can slow down your internet, depending on which provider you choose. Free VPN’s are not recommended, for this reason, and others). Finally, you want a VPN provider that has an easy to use app to keep things simple. With so many VPN Providers, and so many websites recommending different VPN services, it can be overwhelming to make a decision. To make this easier, we have compiled a list of the best VPN providers. IPVANISH have been around for a while, and they’ve gained a great reputation in the industry. IPVanish is one of the only tier-1 VPN networks, meaning they own and operate every aspect of their VPN platform, including physical control of VPN servers. This gives IPVanish users security and speed advantages over other VPN services. Their VPN network spans 40,000+ IPs on 1000+ servers in 60+ countries, giving you the ability to surf anonymously and access the unrestricted Internet from every corner of the globe. The huge list of 1000+ servers in 61 countries means that you can keep your location confidential, while shared VPN connections make traffic completely untraceable. They keep ZERO traffic logs, unlimited bandwidth & use 256-bit AES encryption for security. Super easy to use App, with a great user-friendly interface. There is no need to manually configure the VPN via the Android settings – the app takes care of this. Many options + advanced in-app options such as the Kill-switch, auto-start VPN on boot & more. Their app is by far the best we have seen, with the most amount of user-configurable options. Regular app updates and improvements on all platforms. Many countries servers to choose from – Netherlands being our top pick. Ability to filter/sort servers based on things like ping/latency/load, to help you choose the closest servers to your location. Advanced filtering options such as <50ms / 50-100ms etc, aswell as sorting servers by response time/load. Ability to see which VPN Servers are currently under load (have many users connected to them) – while this feature is suppose to deter you from that server (due to it being ‘clogged up’), however at the same time it shows that those specific servers are popular for a reason – usually they are faster than others. A handy tip for you to keep in mind. Ability to setup a time interval for your IP address to change automatically. 10 simultaneous connections allowed on multiple devices using the same account. App Available on Android/Windows/MacOS/iOS/FireTV/Linux/Windows Phone. Not all countries allow you to select a specific city from that country. For example, you can choose to connect to ‘Sydney, Australia’, aswell as ‘Melbourne, Australia’. However, you can only connect to ‘Italy’ (without further specifics). The specific cities are only available on certain ‘popular’ countries. While we do understand that IPVanish have multiple servers in each country, some of the countries will only have the name of the country & automatically select a VPN Server City for you. This is a down-side because if a certain (for example), Italian server has had its IP address blocked by RAI (a popular FTA Italian TV & Media Content provider), you cannot simply switch to a different Italian VPN Server. Thus, leaving you ‘geo-blocked’ from the RAI website even though you are using an Italian VPN/Ip address. (Please note: this point is only directed to those who are interested in accessing ‘geo-blocked’ sites. A ‘geo-blocked’ site is a site which has only been made available to a certain country). While they do advertise 1000+ servers, as mentioned above, you cannot manually choose between 1000 servers. You are mainly limited to the 60+ countries + multiple servers/cities for SOME countries, like USA, Australia, Germany etc. This probably means roughly 80 servers are available for you to choose from. ExpressVPN have been around for a while, and they’ve gained a great reputation in the industry. ExpressVPN are known for their high speed VPN servers, ultra secure, and easy to use service. They operate a Huge network of 2,000+ global VPN servers across 94 countries, giving you the ability to surf anonymously and access the unrestricted Internet from every corner of the globe. ExpressVPN users often report faster speeds than other VPN services. Based in the British Virgin Islands, a tropical oasis without data retention laws. No activity logs. No connection logs. The company is located offshore, in a country where there are no data retention laws. ExpressVPN users often report faster speeds than their competitors users. More choice when it comes to selecting specific cities within specific countries. Choose between 145 server locations around the world (more user-selectable servers than their competitors). Many options + some advanced in-app options such as the Kill-switch & more. Ability to filter/sort servers based on latency & speed, to help you choose the closest servers to your location. In-app server speed-tests to help you find the VPN servers with the fastest speed based on your location. Ability to run a speed-test on all ExpressVPN servers to find out which ones are faster for you at any given time. This is a very handy feature, saving you time from ‘trial & error’. 3 simultaneous connections allowed on multiple devices using the same account. If you would like to use your subscription on more than three devices at any one time, you will need to purchase an additional license. App Available on Android/Windows/MacOS/iOS/Blackberry/Linux/Windows Phone. 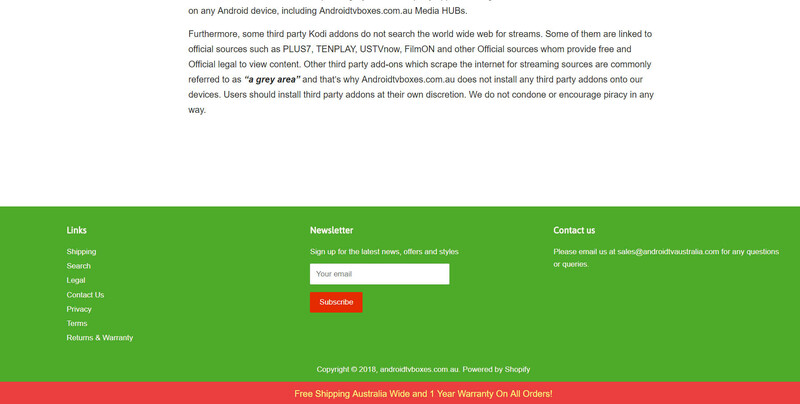 New ‘Android TV Box Australia’ websites are popping up at a rapid pace – so who can you trust? Which websites/sellers are legit, and which ones to avoid? 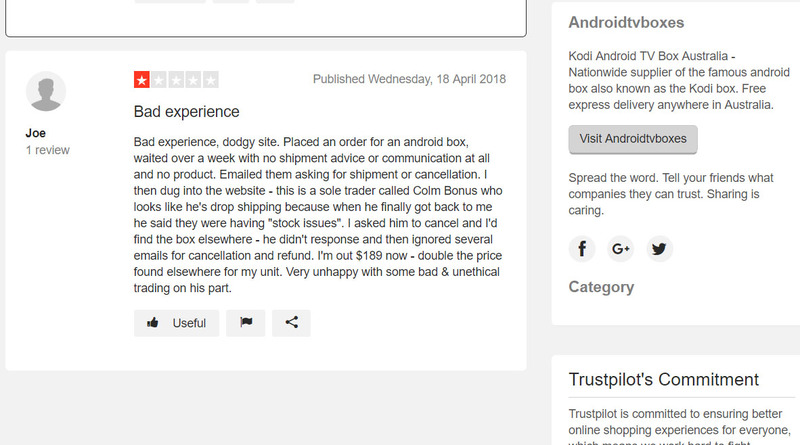 It has been brought to our attention that there are a number of new websites emerging claiming to be Australia’s Largest Android TV Box / Kodi Box Retailers – while this news/blog post may seem a little biased coming from DROIDWORLD, it is indeed worth a read. DROIDWORLD welcomes competition, aswell as new ‘players in the Android World – however, there are a few alarming facts that we feel the need to expose to keep consumers and online shoppers safe. 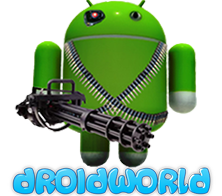 DROIDWORLD is a family owned business established in Melbourne. What started off as a home-eBay side job in 2013, evolved into a legitimate company with a name Australian’s have learned to trust. What used to be simply importing products from overseas sellers to re-sell locally, evolved into climbing the chain and directly dealing with major manufacturers – aswell as in-house quality control (hardware + software), often with firmware/software optimization for Generic Android TV Boxes. You may/may not be aware, but for every ‘generic’ android tv box, there is over a handful of factories which produce them abroad. We would like to inform customers of the potential dangers of trying to source the cheapest price available. 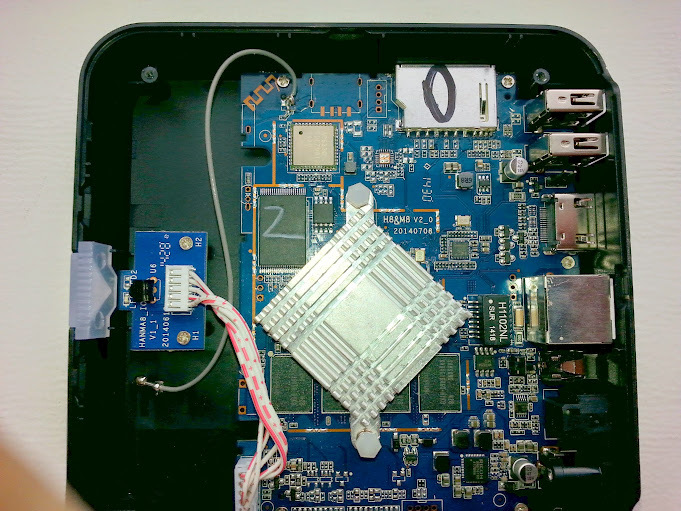 (a) ‘Clone Boxes’ – Often referred too as ‘clone boxes’, they are android tv boxes which look exactly the same (identical), but contain totally different hardware inside. By totally different hardware, we don’t mean the CPU or the amount of RAM OR the amount of storage. We are referring to the actual PCBA (the main-board), being a totally different design with different components. 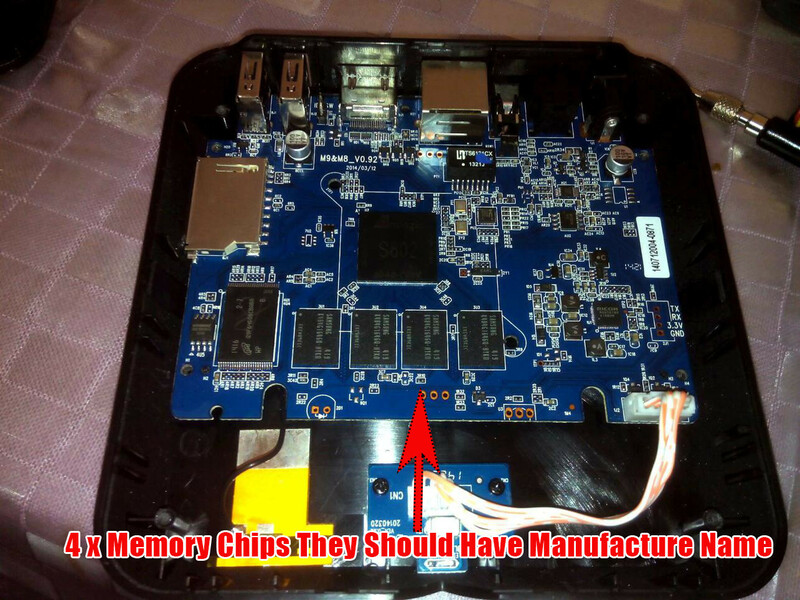 This is a cause for concern when there is no hardware protection circuit (or a poorly designed one), or inferior components and chip-sets being used. It also means that your box may not be compatible with firmware updates or custom firmware you find online (with the same name/model as your device). The clones will always have inferior variants of brands being used for RAM, NAND-Flash / eMMC Storage & WiFi. Why does this matter? It matters because a no-name or unknown Storage chip can become faulty quite quickly – plus the slower read/write speeds means a totally awful experience for the user. Good quality devices usually use Samsung or SK HYNIX for the RAM / Storage, while the clones usually have no brand names. (b) Nasty factories – there are factories which produce devices with recycled parts, and house them in a brand-new-shiny ‘shell’. The recycled parts are used from returned/faulty devices (where anything from the faulty boxes hardware which is still working is salvaged/recovered), and then used to re-produce new boxes sold as ‘brand new’. The factories offload them to middle-men sellers abroad (in China), who then sell them at cheaper prices to unaware buyers. These unaware buyers are often the local sellers buying wholesale/bulk at cheap prices to re-sell locally. (c) Bad Power Supplies – This point is often over-looked, but shouldn’t be. A poor quality power supply / adapter can be the cause of your device becoming faulty – they can also kill your device slowly. We have seen one too many devices stop working due to a bad power supply. Also note that international adapters which make a buzzing sound at the power-point (due to being loose) are also a danger to the device, as they cause spikes of incorrect voltage which ultimately will lead to your device ceasing to work. (d) ‘Get in, Get out’ – Many people will jump onto the ‘next big thing’ for a quick buck – otherwise known as a ‘money making scheme. Will the seller be around 3, 6 or 10 months after your purchase to replace or repair your faulty device? Will the cheaper price be worth the saving if you are left without support when you really need it? Will the seller honour the Warranty they are obliged to provide to you as an Australian consumer? Is the seller confusing you or misleading you with technical / complicated words, like ‘latest android 7.1.1’ or ‘latest kodi 17’ – leading you to believe that the version number of (in most cases) update-able software is the most important factor of the sale? The main factor is to buy an Android TV Box which has a minimum of Android 5.0 Lollipop (do not purchase an older one with Android 4.4). The KODI version number is also not important, as you can always update the KODI version from the App Store. The entire android version gimmick came to existence when KODI released an announcement that the newer version of KODI (at the time, KODI 16) will no longer support Android 4.4 and below (due to using a new API which is only available in Android 5 and above). Our personal sweet spot is Android 5.1.1 – as Android 6 is only beginning to be a stable performer – while Android 7+ boxes are very buggy. Before we get started, we have to address the issue of websites imitating our website, including the way we lay out our page. With many directly copying & pasting content – plus false claims such as being ‘the largest seller in Australia’. But the question that will be asked is why? Why set up a ‘fake’ web site (or a website with fake claims) pretending to be something that you are not? Let us explain. The hardest thing to do when it comes to business is keeping a secret. Everybody wants to be involved in the next big thing. When someone sees potential profit in a particular niche, they just can’t wait to jump in. This is what we believe to be a classic example of a ‘Get in, Get out’ seller. Using the ‘wayback’ machine, we can travel back in time to see how a website looked like in its previous life. 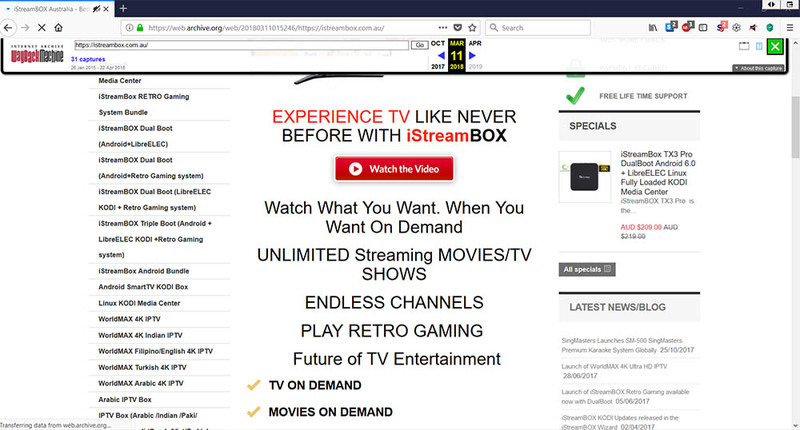 Below you can see we have traveled back to the 11th of March 2018, when iStreamBox was still a ‘kodi box’ ‘android box’ seller (using our famous ‘watch what you want, when you want’ slogan ofcourse). 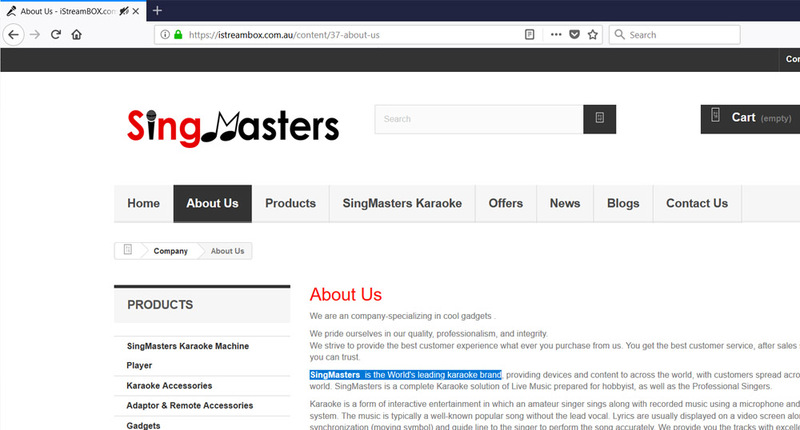 Today however, iStreambox has been re-branded to ‘SingMasters’ – “the world’s leading karaoke brand”. (there is also a new website registered for the new ‘company’, which we won’t mention here). There is absolutely nothing wrong with a change of business plan, nor a new business venture. But this is deceiving. This website appears amongst the top results when searching Google for a TV Box in Australia (due to the domain name). 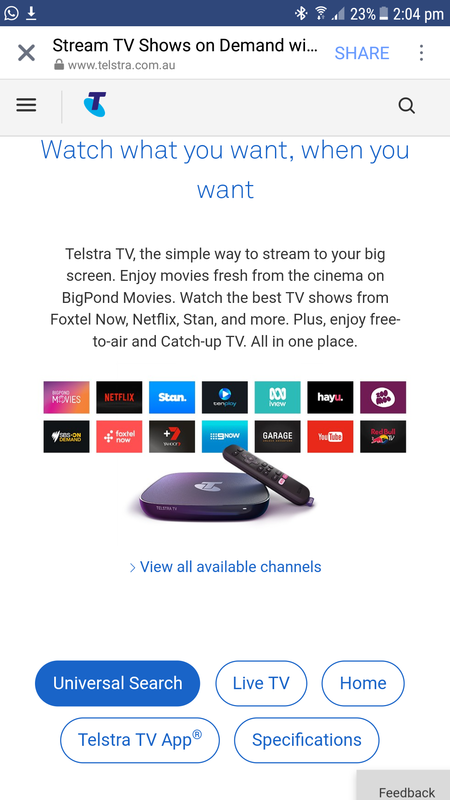 This leads people to believe that this may be the top choice for purchasing an Android TV Box in Australia – where in reality, this is a fairly new website. (a) this website has dug deep to find the DROIDWORLD website theme, and has gone ahead and implemented it into their own website, giving a very similar feel and look which we believe to be misleading. While we do not own the website theme, and any person can purchase a license to use the theme, it does seem a little skeptical why a new ‘android tv box’ website would copy the design of an existing ‘android tv box’ website. The conclusion; You can clearly see that the highlighted text has been directly copied and pasted. We believe that a genuine, honest & reputable seller would not start a new business venture by copying content from original existing sellers. We think that this practice is another example of a ‘get in, get out’ seller. We’ll let you decide. 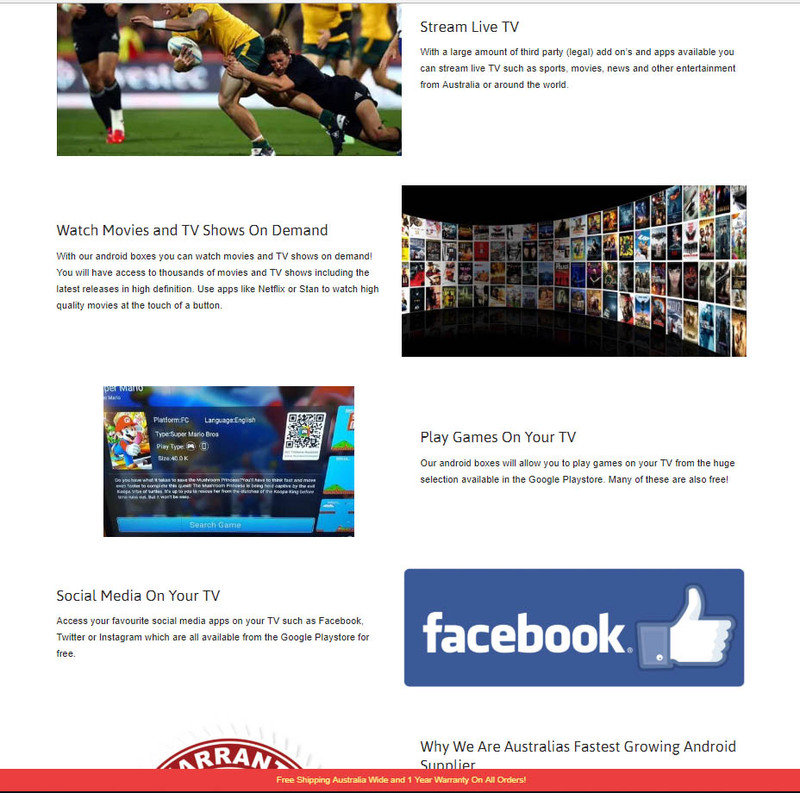 Here we have another website which appears amongst the top results when searching Google for a TV Box in Australia (due to the domain name). This leads people to believe that this may be the top choice for purchasing an Android TV Box in Australia – where in reality, this is a fairly new website. (b) more of the classic ‘copy n paste’ tactic to speed things up. See below example of content directly copied and pasted from the DROIDWORLD website. In the last screenshot, you can see that the seller has simply replaced ‘droidworld’ with ‘androidtvboxes’. (c) another sales gimmick in relation to android and kodi version numbers. Quote from the website: “Our android boxes allow you to access thousands of apps in high definition on your TV screen by turning your TV into a multimedia entertainment system! It is important to note that all of our android boxes come with android 7.1 Nougat which is the latest version so you know you are up to date when buying from us.“. The conclusion; Again, you can clearly see that the text has been directly copied and pasted. The seller is also using tactics to make users believe that version numbers are the most important factor of the sale (we explained the issue with this earlier in this article). We believe that a genuine, honest & reputable seller would not start a new business venture by copying content from original existing sellers. We think that this practice is another example of a ‘get in, get out’ seller. We’ll let you decide. What is ‘drop shipping’ ? Drop shipping is being the ‘middle-man’ between a buyer and a seller – and is a very common practice on eBay & online websites. (a) i launch an eBay store, or a website, advertising many products. (b) i do not hold any stock, rather, i list stock which i can source from China. (c) buyer visits my website, and buys ‘product XYZ’. (d) i proceed to purchase ‘product XYZ’ from my China source, however, i use the address of my buyer rather than my own, so that the item goes directly to the buyer. (e) i make a quick and easy profit. (a) i up-sell the product, and cannot really provide a real Warranty or support service, as i have no real relationship with the supplier or the manufacturer – I also do not have stock on hand to replace any faulty products – so i am taking a risk and hoping for the best (ie; that the item is functional and as described). Also, if a product was faulty, my profits may be too slim to replace the product for the customer (ie; the profit does not cover the cost of another replacement item). (b) the customer does not know this, and thinks he is dealing with an Australian business. (c) customers are usually willing to spend more buying from an Australian seller, for peace of mind; which is the peace of mind knowing that they can return the product if need be, or can have the product repaired/replaced if there is a fault. They pay the extra mark-up as there are extra costs for Australian businesses which includes rent, GST, employees, bills, and a real Warranty service. Unless there is a real Warranty service in place (which is hard to know for new websites), it is just not right to pay someone a higher price when you can simply take the same risk & order the product from China by yourself. This does not mean that all ‘drop shippers’ are deceiving customers, or that they all do not have a Warranty service – it just means that you should be cautious of trusting any random site. *Note: DROIDWORLD does NOT dropship – all of our products are located in our Melbourne warehouse. Please note that these sellers simply install Kodi on the box with some extra added Addons or extra added Android Apps. Kodi Addons change all the time, addons disappear/die, and new ones are released constantly. This means that after 1 month your favourite addon that was included on your ‘Kodi Box’ can simply stop working – and then you may think ‘My Kodi box doesn’t work anymore’. There is no such thing as a ‘Kodi Box’ – it is an Android Box with the Kodi application installed on it. The difference between the SuperMax Wizard and those ‘fully loaded’ boxes that you see advertised everywhere, is that the SuperMax Wizard will always update its configuration – meaning the addons will always work. The other key difference is that the SuperMax Wizard provides a clean, simple, legal configuration. We hope we have given you some positive insight to make a smarter choice when shopping online. There are various FTA (free to air) International Channels which are broadcasting the FIFA World Cup 2018. You can find the full list of channels which are broadcasting the 2018 FIFA World Cup by clicking here. Some of them are ofcourse, paid premium channels/providers > Such as Optus Sport for the Australia region. Optus Sport costs $15 a month and you do not need to be an Optus customer. A great deal indeed and a thumbs up to Optus for providing access to non-Optus customers! With Optus Sport however, there is a catch. You cannot watch using a ‘rooted‘ / ‘jailbroken‘ device. This means you can only use Optus Sport on MINIX Android TV Boxes and XMEDEX Android TV Boxes. However, there are many FTA channel providers which are broadcasting live and free to the public – this even includes SBS Sports (although SBS does not have rights to ALL the games). EDIT: 20/06/2018: Optus Sports has been having technical issues with the streaming service (buffering/freeing), in order to compensate to the Australian public, they have generously provided the OPTUS SPORTS App for FREE for everyone to use until the 31st of August 2018. This means you no longer need to subscribe for $15/month to watch the 2018 Fifa World Cup in Australia. Furthermore, they have provided SBS the broadcasting rights for the entire FIFA World Cup, which you can stream FREE using the SBS APP for Android or the SBS App for iPhone/iPad/iOS. 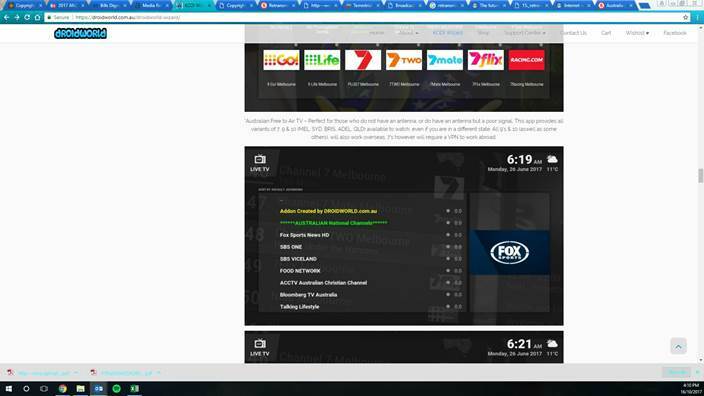 If you prefer to watch using your Computer/Laptop/PC or Android TV Box, then Click here for a direct link to the SBS Live Stream (if you don’t have the necessary KODI Addons or the SuperMax Wizard, you can click this link directly from your Android TV Box’s internet browser to Stream Live from SBS). Once on the page, simply scroll down until you see the current game, then click on it to open the live stream. (the streams are only available LIVE when the game is on – so make sure you open the link and click on the correct match at the correct time). To access FTA broadcasts of the FIFA World Cup using KODI, we suggest you use the SuperMax Sports KODI Addon > which is 100% legal, and only lists FTA providers. Some of them may need a VPN due to geo-restrictions > however, many do not. This includes Free to Air Live Streaming of the FIFA World Cup from Germany, UK & other International providers. You can also watch all the match highlights, results & more using the KODI Addon. SuperMax will be releasing a free FIFA World Cup KODI Addon available to the public (without the need of having a SuperMax Wizard Account or being a SuperMax user), which we will post on this page soon. Watch this space for updates. Upgrading your MINIX Neo Z64W from Windows 8.1 to Windows 10 is a breeze! Step 1: Download the Windows 10 Upgrade Assistant Tool from here. This is similar to the Microsoft Windows 10 Assistive Technologies Update tool which helps eligible users to upgrade to Windows 10. It is a simple, automated process. Step 2: Run the program on your MINIX Neo Z64W and follow the on-screen prompts! Step 3: There is no Step 3! You will have Windows 10 up and running in no time! You will have the option to select whether you would like to Keep personal files and apps, or Keep personal files only, or choose to keep Nothing during the upgrade. If you choose to keep nothing, it will install a fresh copy of Windows 10 on your device. However, if you wish to keep everything intact, such as your WiFi Password, personal data, programs, apps, Kodi addons etc – then you should select the option ‘Keep personal files and apps’. Your MINIX version of Windows will remain Genuine and Active using your existing Product Key / License. Your copy of Windows 10 will automatically activate later using your digital license which is pre-installed on your device. Please read the Microsoft T&C’s to ensure eligibility of using this tool before proceeding with the download/update. Are your devices jailbroken or non jailbroken? 1) There is no such thing as ‘jailbroken’ on android – although you will see many advertisements with ‘jailbroken/unlocked’ as a marketing gimmick. They just mean that the ‘box is unlocked you can watch everything’ etc. The real term ‘Jailbroken’ is applicable to iPhones only. The equivalent for Android is called ‘root’. If a device is ‘rooted’, it provides ‘root access’ or more permissions in simple terms. For example, you can make the device do things that non-rooted devices cannot, ie; you can edit the devices name or change the animation video that appears when you first turn the device on. You can also browse hidden directories and folders on your device, and make changes in those directories (think of this like the ‘Run as Administrator’ function on Window’s PC’s). You can remove bloatware (pre-installed manufacturer apps) & much more – but this is not really something the average user will take advantage of nor have any interest in. It does come handy for developers or people with the ‘know-how’ interested in taking full advantage of their device. Certain functions or apps will not work without ‘root’. 2) Some paid streaming apps for Android block devices which are ‘rooted’. This includes Presto & Stan (but not NetFlix). I believe they do this as a security precaution, although in reality it’s just paranoia. A rooted device cannot access Presto or Stan for free without a legitimate account. Hence the big players like ‘NetFlix’ know this and do not block any rooted devices (this means you can use NetFlix on a rooted device). NOTE: FOXTEL NOW / FOXTEL GO does not work on ANY Android TV BOX (including non-rooted ones) – this is not due to ‘root’, they block any device which have HDMI output (because they dont want you to watch this app on your TV, as that will hurt their standard Foxtel cable service). – MINIX (all models) – MINIX devices have never come rooted from factory, and are recommended for those looking to use official paid streaming services like Stan or Presto. – XMEDEX (all models). XMEDEX devices do not come rooted from factory, however, they have a cool feature in the settings; they have a ‘one click’ root option > which roots the device with a simple click. They also have the option to ‘remove root’ with a single click. So that’s something to take note of for those who wish to experiment. All other Android TV Boxes are rooted from factory (this includes tronsmart, beelink and other generic devices). You cannot unroot them (while it is technically possible, it is not recommended to try – as it is very easy to ‘brick’ the device in the process and render it unusable). Please remember that you can use NetFlix on rooted devices, aswell as many other official paid apps and services. (the only 2 apps we have come across which block rooted devices are Stan & Presto). * NetFlix has only officially partnered with a handful of devices, including Samsung, LG etc. This means all other devices will not be able to find NetFlix on the Google Play Store (or it will say ‘this app is not compatible with your device’). Not to worry, though! This doesn’t mean you can’t use NetFlix on your device (NetFlix will work on any Android device). * You need to install NetFlix from outside the Google play store > this is due to the fact that NetFlix has only chosen a handful of manufacturers/devices to partner with. Any other android box or device will face the same issue. When downloading from the Google Play Store > it checks your device name/model > and if not on the “whitelist” that NetFlix has chosen, you will be unable to download/install the app. Also note: the official version of NetFlix from the Google Play Store, has also been reported to not be working on other Android devices. (so before you follow the instructions below, i would recommend you uninstall your current netflix version from the android settings, if you already have NetFlix installed). 2) If you own a MINIX branded box, MINIX have advised that they have sorted the issue in the final firmware update > which has netflix pre-installed. Please update your devices firmware. To update the firmware > go to the ‘all apps’ section. And there is an app inside for the MINIX System update. Once you do the update, go back and check again for any new update (they update in increments, so there may be more than 1 update) – keep updating until you finally install all the latest updates. This is a software/firmware issue – and generally caused by performing MINIX updates. In some cases the box may be like this from the get-go, in other cases it can happen over time or directly after performing a MINIX OTA update. Once you are sure you have the pin inside and ‘clicked’ (you will feel it) – keep holding the pin inside, now press the physical ON button on your MINIX box (at the same time while you are holding the pin) – and keep holding the pin for 10 seconds. If successful, you will enter the ‘android recovery menu’. Inside the android recovery menu, there will be a few options such as ‘wipe data/factory reset’ , ‘wipe cache’ , ‘reboot’ etc. You need to select the option ‘wipe cache‘, (NOT ‘wipe data’) – Once selected, you will see some yellow text on the bottom of the screen (this is the wiping process). Once complete, select ‘reboot’ from the menu, or simply unplug the box from the power, and turn it back on again. The issue will now be resolved and your device will perform super snappy once again. Note: this is also the same process for any other android tv box / kodi box (except for most other devices, you need to place the pin into the reset hole BEFORE plugging in the power – as some boxes turn on instantly when plugged in the power). It’s a good idea to perform this action every couple of months to keep the device running smooth. Also note that we can provide refurbishment services for any android box, even if not purchased through us! Installing the new version (different than the standard wizard update – its an actual update to the program itself) is very important, as it contains modules required for the Kodi addons to work. IF YOU ALREADY INSTALLED THE NEW VERSION OF THE APP THEN YOU DON’T NEED TO DO IT AGAIN! SuperMax is technically, a ‘service provider’. New laws in the UK/EU no longer allow providers or sellers to pre-install apps which fall in the‘grey area’. Keeping in mind that SuperMax never did install any illegal addons, rather, addons which point to websites that host third party, channels or content. It won’t be long before Australia follows suit – SuperMax plans to stick around! In order to keep the SuperMax service alive, running & maintained for you guys, the team need to abide by these new rules. This is to ensure that SuperMax will always be here to maintain the service. Don’t let the above frighten you – You can manually install any of your favourite third party apps. Doing so is super easy! You will now have a HUGE list of other Kodi addons to browse from public repositories. Simply scroll down the list until you find the name of your favourite addons. To install the addon, click on it, then click ‘install’. Once installed, this new addon will be in the “My Addons” section of the media center. You can also visit dedicated Kodi Addons blogs/websites like this one: http://bestforkodi.com/?s=kodi or this one: http://kodi-addons.club/ which can provide you with the latest Kodi Addons from third parties, downloads & installation instructions. *Information provided for reference material only, and to lessen the flux of support enquiries being received which relate to this topic. DROIDWORLD is not affiliated with any of the above sources and does not condone the installation or use of third party addons which provide or link to copyrighted material. 27/06/2017 – There is a new version of XMedia Center (Kodi) which has been released today. If you purchased/received your device before this date, you need to update the program now. (Please note that this is different to the standard update via the Wizard. This is an update to the actual Kodi platform). We have developed a fork of Kodi which merges Kodi 17 and Kodi 16 (combined). For those who aren’t aware, Kodi 17 is SUPER BUGGY! We personally dislike it, as do many others. It especially has playback issues aswell as other bugs. Also take note that if you were mislead by other sites claiming that you need to buy a new box to continue to enjoy Kodi – you have been lied too! Kodi currently does not have any Android engineers, and have stopped supporting the AMCodec, RKCodec & libstagefright video codecs for quite some time now. These along with other patches used to be used to fix stuttering, HD playback & more for Kodi on Android. Whilst they keep upgrading Kodi to 17, soon 18 – these numbers don’t mean a thing, other than playback issues and bugs for Android users. Our version of Kodi will work on all Android devices, including those older than Android 5.1 (ie; Android 4.4 kitkat). You can read more about that here from a third party article. Today we will release the APK’s (apps) to the public. XMedia Center is originally a custom fork of Kodi (made by XMEDEX) which is tailored and designed for Android TV Boxes – you will find that it can handle video playback much more effectively than the standard Kodi 17, whilst bringing further enhancements for TV Box chipsets. (Please note that XMEDEX is not affiliated with SuperMax or the Wizard or addons, or our services – so you should not contact them for support). The versions of XMedia Center below are those modified to include the SuperMax Wizard installer. Before you rush to download, we would like you to click here to visit this page which outlines new changes to the SuperMax Wizard service, aswell as the included content. If you already have XMedia Center installed (older version) – you should uninstall it first. (if you have the original Kodi installed, you dont need to uninstall it, as you can have both XMedia Center and Kodi running side by side, Although we do recommend you uninstall Kodi too as it will save you disk space, and you wont need to use it anyway). To uninstall XMedia Center or Kodi, you need to go to the android settings of your box. For older AMLogic based boxes running Android 4.4 kitkat (such as MX3, M8, Minix X8H Plus etc), you need to go to the ‘all apps’ section of your device. Then find and click on ‘SettingsMBOX’, then go to the ‘Other’ Tab, then click on ‘More Settings’. Now the standard Android settings menu will appear. Scroll down and click on ‘apps’ – it will now display all the apps installed on your device. Keep scrolling down until you see “XMedia Center”, click on it, and then press “uninstall”. To uninstall XMedia Center or Kodi on newer boxes using Android 5 Lollipop or above, (or older Rockchip based boxes such as CS918B), its much more simple. Just go to the ‘all apps’ section of your box, then find and click on ‘settings’. Now the standard Android settings menu will appear. Scroll down and click on ‘apps’ – it will now display all the apps installed on your device. Scroll through the “downloaded apps” until you see “XMedia Center”, click on it, and then press “uninstall”. To install the new version of the media center, you simply have to open the internet browser on your box. Once you open the internet browser, you will need to type the applicable link in the top address bar (please note, you need to type the link in the HTTP:// ADDRESS BAR – NOT in the google search bar!). Please type the link which is for your box (VERY IMPORTANT TO CHOOSE CORRECT ONE OTHERWISE WILL BE VERY BUGGY AND CRASH) – if you need help choosing the correct one, just let us know! (DO NOT install the version above if your box does not say “XTREME” on it, or if you are not sure if your box is the XMEDEX XTREME model). Once you hit OK, it will automatically start the download in the background. Once the download is finished, go to the ‘all apps’ or ‘my apps’ section of your device. Inside there, there is a ‘download’ icon. Open that folder, and inside you will find the downloaded file. Simply click on it, then click ‘install’. After the package installs, if you would like to install a country package (such as the greek option pack), click on the new ‘update’ menu. This will launch the supermax wizard directly (it may take a few seconds to pop up). Then instead of clicking ‘install package’, this time click on ‘country layouts’. Press the up arrow key to highlight ‘greek’, then click the right arrow key to press the red ‘install’ button. This will add a new greek menu to the homescreen. If you are not a DROIDWORLD customer, you are still more than welcome to use this custom version of Kodi on your box. It will have the SuperMax Wizard installed in the ‘programs’ section, but you can disregard that and pretend it doesn’t exist. We have released the apps to the public to help the community for those who have older Android Boxes that have been told they need to throw it away and buy a new one. Or for those who have purchased a box from elsewhere without doing enough research, only to face playback issues and other bugs rendering the box useless (for Kodi). If you are not a DROIDWORLD customer, but would like to use the SuperMax Wizard on your device, without having to buy a new box from us, you sure can! You simply need to purchase a license for the software. It is a one-time fee, which will activate your device to use the SuperMax Wizard service. (Note that each license is valid for ONE device only). This remote has a built-in rechargeable battery. Please note that the buttons on the front, top half of the remote which are ORANGE in colour, are IR programmable keys. Ie; you can make them learn any IR signal from another remote control. Another way to know which buttons are IR based, and which buttons are RF (wireless), is the colour of which the LED blinks when you press the button. When you press a button on the Rii i25 remote, the LED will either blink orange, or blue. All of the buttons which the LED blinks blue – these buttons are wireless buttons, and will control the device which you have plugged in the mini USB receiver into. All of the buttons which blink orange (mainly, the buttons on the top half of the remote – including the arrow keys and OK button) – these ones are IR programmable buttons. For these ones, you need to program them to learn any button from any remote. Some people like to program these buttons to control their TV. For example, you can make this remote control turn your TV on/off, adjust volume from your TV, change the source TV/AV/HDMI etc – this way you can use one remote to control everything. Other people prefer them to just control their Android box. If you would like them to just control the Android box, you can program the IR buttons to learn the signals from your Android box’s original remote controller which is included in your packaging box. (the smaller IR remote). You can also mix and match – ie; program the arrow keys and the OK button from the Android Box Remote controller, but program the ON/OFF button and volume keys from your TV remote controller. Please refer to the below diagram for instructions on how to program the ORANGE coloured buttons to suit your needs. 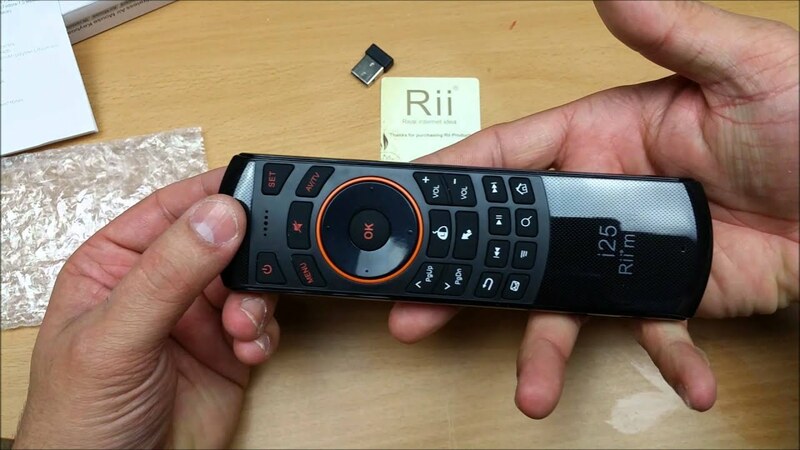 All other buttons on the remote controller use the RF wireless signal and will control your Android TV box automatically. If you have lost your copy of the original Rii i25 User guide / instructions manual, please click here. Some third party Kodi addons may ask you to visit a website to ‘pair’ your device before allowing you to watch the video stream. You do not need to do this from the box, you can do this from any device connected on your home internet. For example, you can visit that website from your mobile phone, or from your laptop. When you visit the website, you will see a box which says “im not a robot”, you need to click on that box so that it is ‘ticked’. Once ticked, scroll down to the very bottom of the page, and there will be a button called ‘pair’ – if you click it, the stream will then load on the box – and you will be ‘paired’ with this website’s sources for 4 hours – without needing to ‘pair’ again. So you’ve heard about the new MINIX Neo A3 air mouse, but are not sure what the difference is from the previous Neo A2 Lite air mouse. This can cater for things such as Searching YouTube or Google by voice, etc. – it is a handy feature indeed as the Android system now offers the ‘voice search’ functionality in quite a few areas, and android apps are now starting to support this feature more often than before. Although we have seen this microphone/voice search feature already on the XMEDEX PRO Air mouse controller for quite some time now. AFTER YOU INSTALL THE MAIN PACKAGE, YOU CAN INSTALL AN ADDITIONAL COUNTRY OPTION PACK IF REQUIRED. (THE COUNTRY OPTION PACK WILL ADD A NEW MENU TO THE SCREEN WHICH WILL GIVE YOU EASY ACCESS TO ALL THE CONTENT FROM THAT PARTICULAR COUNTRY) – THIS WILL MAKE IT EASIER FOR YOU TO ACCESS INTERNATIONAL CONTENT. THINK OF IT LIKE ITS ADDING ‘FAVOURITES’ FOR YOU WITH ALL THAT COUNTRIES CONTENT. THEN PRESS THE RIGHT ARROW KEY (ON YOUR REMOTE CONTROL) TO PRESS THE RED INSTALL BUTTON – PRESS OK AND CONTINUE – THAT’S IT! THAT’S IT – THE REST IS ALL AUTOMATED AND IT WILL DO EVERYTHING FOR YOU. THE COUNTRY PACKAGE DOWNLOAD IS VERY SMALL – IT WILL ONLY TAKE AROUND 30 SECONDS TO INSTALL. WHEN THE PACKAGE IS FINISHED INSTALLING, YOU WILL GET A POP UP THAT TELLS YOU THAT IT HAS SUCCESSFULLY COMPLETED, IT WILL TELL YOU TO PRESS OK AND DISCONNECT YOUR BOX FROM THE POWER. THE NEXT TIME YOU TURN THE BOX ON, THE MEDIA CENTER WILL AUTOMATICALLY CREATE A NEW MENU ON THE HOMESCREEN WHICH IS CALLED “GREEK TV” with the Greek flag and Greek background – (NOTE: it can take around 30 seconds for this new menu to generate the first time), AND INSIDE YOU WILL HAVE MANY NEW OPTIONS SUCH AS ‘greek tv’ , ‘greek movies’, ‘greek series’ ‘greek radio’ ‘greek live channels’ etc. IT IS THE SAME PROCESS FOR INSTALLING ANY OTHER ‘COUNTRY PACK’ SUCH AS ITALIAN, ARABIC, TURKISH, VIETNAMESE, INDIAN, AUSSIE PACK. FOR ALL OTHER COUNTRIES WHICH DO NOT HAVE AN ‘OPTIONAL COUNTRY PACK’ AVAILABLE FOR THEM, YOU CAN ACCESS THOSE COUNTRIES CONTENT VIA THE “WORLD” MENU WHICH IS ALREADY AVAILABLE ON THE HOMESCREEN WITHOUT DOING ANYTHING EXTRA. FIRST YOU MUST CONNECT YOUR BOX TO THE INTERNET. YOU WILL GET A POP UP TELLING YOU THAT IT HAS SUCCESSFULLY COMPLETED THE INSTALLATION. IT WILL TELL YOU TO PRESS THE ‘OK’ BUTTON AND DISCONNECT THE POWER FROM YOUR BOX TO FINALIZE THE INSTALLATION. NOW THE NEXT TIME YOU OPEN THE MEDIA CENTER, IT WILL LOOK DIFFERENT, THE SUPERMAX PACKAGE HAS BEEN SUCCESSFULLY INSTALLED!! CONGRATULATIONS! IF NONE OF THE ABOVE HAPPEN WHEN IT REACHES 100% IN THE INSTALLATION, (if the download/install screen disappears and its now just stuck on the Wizard page) THIS MEANS IT DIDN’T SUCCESSFULLY INSTALL. THIS COULD BE BECAUSE YOUR INTERNET CONNECTION DISCONNECTED DURING THE DOWNLOAD, OR FOR WHATEVER REASON IT WAS UNSUCESSFULL IN INSTALLING THE PACKAGE. IF THIS IS THE CASE, THEN YOU NEED TO ‘CLEAR DATA’ AND INSTALL THE PACKAGE FRESH (it is exactly the same process as above, except there is 1 additional step to do first. The additional step is to “clear data” first). Now simply go back to the homescreen and open the media center application again (and follow the same instructions above for ‘installing the package’ again). IT WILL WORK! It has been reported by people with data caps that there internet data usage is being excessively used up really fast after the latest SuperMax Wizard update – but was perfectly fine before the last update. Some users have reported that the box is using up over 20GB per day (in some cases, even more!) – this is not good especially for people who have a download limit – as this can easily finish your internet data before the month is over (causing your internet to be ‘capped’ and become slow). Its actually the new screensaver in the latest update – The latest SuperMax update introduced a new (and pretty amazing) HD Screensaver. When the box is not in use, it will display random Super HD clips of various city’s around the world, such as New York & Dubai. However, everytime a new HD screensaver appears, it actually downloads it, then displays it – the screensaver app is poorly designed as it does not store/load the pre-downloaded HD screensavers, it keeps downloading them again every single time – so if you leave your box and the media center on, it will keep chewing through your data all day long. You can resolve this by disabling the screensaver, or reverting it back to the default “dim” option. To do that, click on settings, then click on appearance, then scroll down to screensaver, and on the right hand side , there is an option to change the current screensaver, or disable it entirely. Alternatively, you can close the media center when not in use – and this will prevent the screensaver from running all day/night. If you have the Red MUTE icon on your Kodi Media Center screen, and the audio is not working (there is no sound), then please read on! Press “+” or “-” from your keyboard to adjust audio volume or “F8” to toggle muting. You can (if I remember correctly) use “F9” and “F10” keys too to adjust volume. Did you know: You can get a FREE AFL AND FREE NRL LIVE PASS for the entire season if you are with Telstra pre-paid or post-paid mobile plan. It even works from carriers which use the Telstra Network (Example: BOOST MOBILE). If you have any family or friends who are with Telstra on their mobile, you can get the live pass through them. Each live pass can be shared with 3 people and can be watched on 3 different devices simultaneously. If you are not with a Telstra mobile Carrier, you can buy a 12 month Subscription for only $89.99! The AFL Live Pass will provide you with access to ALL AFL Live Games (Official streams), aswell as the 24/7 Footy Channel. (You can already access all the AFL game-replays without an AFL Live Pass – so keep that in mind too). The AFL Live Pass is intended to be used on a mobile device only, using the Official AFL Live app – however, there is an AFL Live addon in the Kodi Media Center which bypasses this restriction and allows you to watch the AFL Live games and the AFL Channel in Kodi, on the big screen (using your Official AFL Live Pass). This is why it may interest you to buy or use an AFL Live Pass so you can access all the Games in Kodi on your TV – for a very cheap price. The NRL Live Pass will provide you with access to ALL NRL Live Games (Official streams), aswell as other premium NRL content. The NRL Live Pass is intended to be used on a mobile device only, using the Official NRL Live app – however, there is an NRL Live addon in the Kodi Media Center which bypasses this restriction and allows you to watch the NRL Live games in Kodi, on the big screen (using your Official NRL Live Pass). This is why it may interest you to buy or use an NRL Live Pass so you can access all the Games in Kodi on your TV – for a very cheap price. If you log in the Kodi addon with your Live Pass details, but get an error when trying to watch a game or channel – the first thing is to check whether your Live Pass is active. To check, download the AFL or NRL Live Official apps on your mobile phone (available on both Android and iOS) – now test to see if the game/channel opens there. If it DOESNT, it means there is an issue with your account and you need to contact the applicable support team. Ie; if you got a FREE pass from Telstra, then contact Telstra support. If you paid for an AFL Live pass on the AFL website, then contact AFL support. If your Live games/channel works on the Official Android or iOS app, but DOESNT work in KODI – then double check that you entered your login details correctly, in the Kodi add-on settings. Also take note of the error message displayed, so you can further troubleshoot. This Channel is available in various third party Kodi Add-ons (you can download and install many third party addons of your choice into the kodi media center). If the channel does not open, it could mean that they have restricted its access to overseas IP Addresses (although at present, it is working fine in Australia) – if this is the case, you can use a VPN (a VPN can “change” your location – so that apps and services think that you are in a different country) – using a VPN is totally legal! However, we recommend using a Paid VPN service, you can read more about that by clicking here. We are talking about the DROIDWORLD homescreen launcher – once you install the new version of the media center, you can no longer access the media center from that ‘media center’ button on your devices homescreen. You need to go to the ‘all apps’ section, and inside there, you will see ‘xmedia center’ , and it will open from there. If you would like to fix the ‘media center’ button on the home screen, then you need to install the updated version of the DROIDWORLD homescreen launcher. The Kodi media center gives the user the option to “add to favorites” for any item (this can be a TV Series, or a particular season, or a particular movie, or even a folder). The Option to ‘Add to Favorites’ is always there. Just highlight a specific show or item of your choice, and then click the letter “C” on your keyboard. If you dont have a keyboard, you click the MENU button on your remote (usually a button with 3 horizontal lines ontop of each other), which will provide the same functionality. You will then get a new pop up (mini menu) on screen with a few options to choose from. One of the options will be called “Add to favorites” , and in some cases, there may also be another option for “Add to Addon favorites” or “Add to Library”. (I will explain the differences shortly). The option you want to choose is “Add to favorites” – this is the main Kodi favourites which is accessible from the Kodi main screen. Depending on which skin/theme you are using with Kodi, the favourites button can be in various locations from the Kodi home screen. For example, with the default Kodi theme, you can access your favorites via the yellow star on the bottom left of the home screen. However, if you are using the supermax kodi theme, there is a dedicated menu on the homescreen which is called “Favorites”, just click on that and it will display all your favorited items. If you want to remove a favorite, it is the same procedure as adding a favorite, except instead of getting the option for “add to favorites”, you will get the option “remove from favorites”. Note: some addons have inbuilt favorites, so sometimes the favorites wont appear in the Kodi homescreen favorites, rather they will appear inside of that addon. For example, if you chose the option ‘add to addon favorites’ (instead of ‘add to favorites’) your favourited item will be inside a folder inside that particular addon. For example, if you are using the “iSTREAM” addon, and you added a show to favorites or library, that show will be in a folder called “mySTREAM” within the “iSTREAM” app. If your box is stuck on the ‘MINIX’ loading screen and not actually booting, this can be 1 of 2 issues. Power supply issue; if the power plug is supplying the wrong volts/amps, this can cause the device to ‘bootloop’ or get stuck on the boot screen. If successful, you will enter the ‘android recovery menu’. Inside the android recovery menu, there will be an option to ‘wipe data’ (to factory reset your box) – this will fix the problem. Please be aware that once this is done, you will lose all data including your saved WiFi password. If you were unable to get into the ‘recovery menu’ to factory reset your device – you will need to manually ‘flash’ the MINIX firmware back onto the box using a PC. Please note: Flashing your box’s firmware via the PC should only be done by experienced people. As installing the wrong firmware or performing the wrong action can cause permanent damage to your box. This can happen to any AIR MOUSE Remote controller – for reasons such as: you are using really low batteries, or you have dropped the remote control. a) Ensure you have fully charged batteries inside the remote. If you are using old or nearly depleted batteries, the mouse cursor will not function properly. This is usually a sign that it’s time to change the batteries. The error here is that most people will put the remote on a ‘flat surface’ for re‐calibration. However, when the remote is on a flat surface, it is slightly facing down. So you should be standing up straight, with your remote in your hand, pointing towards a virtual screen (ensuring that the remote is pointing straight, and slightly up). 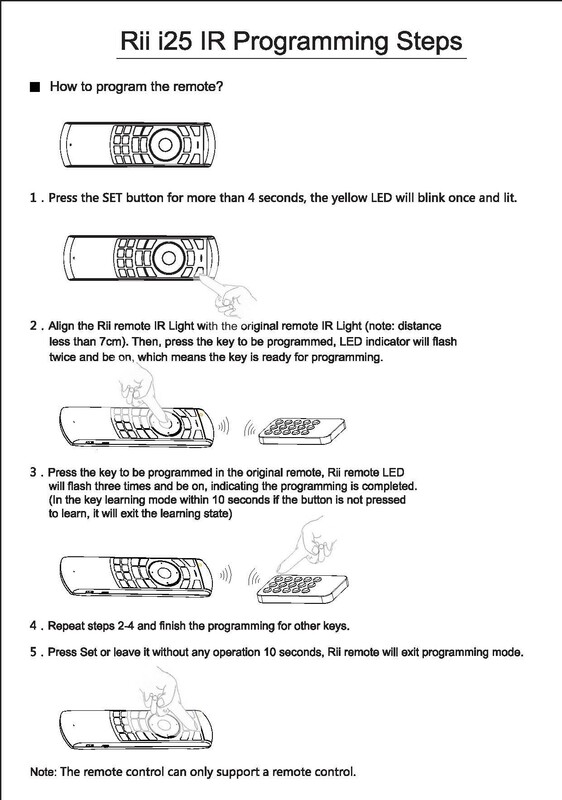 Step 4) The remote will have a static green light (not flashing) for about 5‐10 seconds. During this 5‐10 seconds, is the re‐calibration process. (this is the time when you need to stay still keeping the remote in the position from step 3). If you did not get it right, you can repeat the process. This post is referring to AIR MOUSE wireless remote controllers. It is a common issue with people that use ‘air mouses’. Air mouses will not drain the batteries in your remote when used correctly. However, as stated above, you dont need to turn your box off> you just need to deactivate the air mouse at this stage. Every air mouse has a dedicated button on the controller which will turn the air mouse on and off. So when you stop using your device, just press the air mouse button to deactivate the air mouse, and this will preserve your batteries life. All wireless controllers that we stock have a ‘sleep mode’ – this means that when the remote is not being used (even though your device is switched on) – the remote will stop transmitting a signal. Pressing any button on the remote control will re-activate the remote (but this ‘sleep mode’ will not work if your air mouse is activated). Why are Android boxes on eBay cheaper? Why is DroidWorld more expensive than other Android TV Box Online Retailers? In most cases buying tech products online from overseas (or Australian sellers shipping from overseas) can be a risky business. In some cases, even a nightmare! Especially when it comes to communication, problems, returns or Warranty issues. It is now common for many “Australian” websites or eBay accounts to pretend that they are in Australia, and pretend to ship from Australia, when infact they are actually in China or Hong Kong using expedited shipping services. It usually becomes known when the parcel takes 2 weeks or more to arrive. The issue here is that your Warranty (if any) will also be overseas, and you will be responsible for those expensive returns. We at DroidWorld do also appreciate a bargain, but when comparing our prices with others, you must take into consideration the high quality components used in our products, our software development, Australian taxes and GST, plus other costs which are not applicable to offshore sellers. To compensate for (if any) pricing differences, we provide our customers with an array of bonus benefits on our devices, which are not available elsewhere. Do you trust an Overseas Warranty? Be Smart. Shop DroidWorld, your Local Entertainment Retailer. You can be 100% certain that when buying a DroidWorld branded product, that our products are manufactured to the highest quality. We don’t source cheaper variants or use methods to cut costs. Our products are as advertised, and usually come with custom firmware/software and optimized to give you a high quality Android TV Media Experience. A $20 saving, or a real Powerhouse of Entertainment? Your choice. The IR remotes that come standard with the DroidWorld media boxes are very basic and only designed for basic functions, such as; up, down, left, right, select. We stock a wide variety of wireless mini keyboards/remotes, air mouses etc to use with your DroidWorld Media Box. Feel free to visit our online store. We highly recommend the aftermarket controllers, as they are specifically designed for media content. 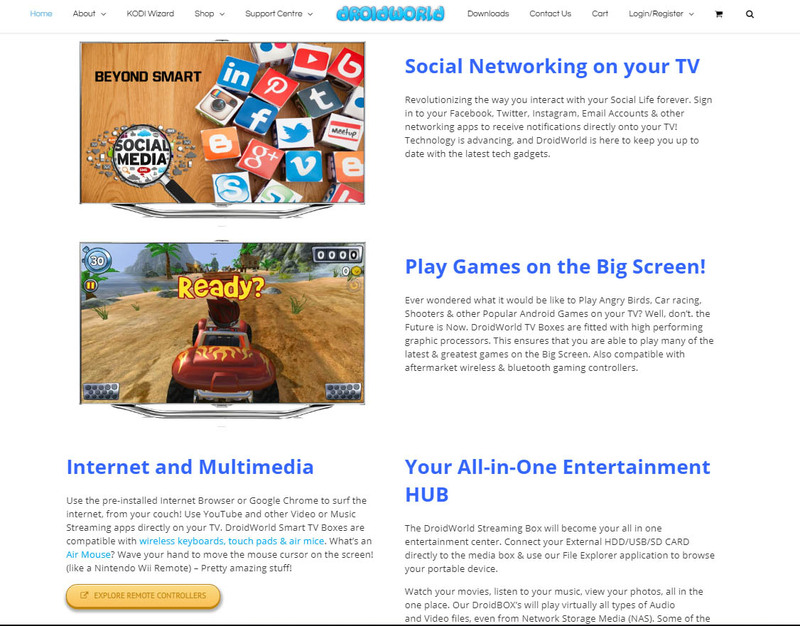 Consider this page as a ‘Blog Post’ – we’re simply wanting to give you advice to help you have a trouble-free internet streaming experience. From experience, both personal & through customers – we will be building this page with as much information as possible (check back frequently to read about any updates or new case studies). *It is important to note that some people may experience really good service, while other people may experience really horrible service from the exact same ISP. This can be due to various factors, such as location, type of service, type of plan, distance from exchange etc. Your experience may differ than those listed below. ‘Belong’ is fairly new – and markets itself as “Simple, hassle free – powered by Telstra”. With first hand experience, we will without a doubt tell you to avoid and beware signing up with this ISP. Belong is actually a division of Telstra, which is their new start up company aimed to compete with other cheaper service providers. We were fooled by the ‘its owned by Telstra, it must be good’ thought. Our speed test results (at www.speedtest.net) and at (www.speedtest.telstra.com) were awesome. The results were 23mbps (on a 25mbps NBN plan) – however our internet was super slow. This triggered further investigation by our own IT professionals. We noticed that on (www.speedtest.net) – it automatically chooses the best ‘server’ to perform the speed test from. Ironically, it was choosing the Telstra server. We changed the server test, to test from an Optus server instead – our speed test result was dramatically different: 6mbps! 23mbps to 6mbps is not a small difference, this is HUGE. We decided to do further testing; we changed the server again to test our speed using a USA hosted server, the result > around 1mbps. We also downloaded a test file from an iiNet Australian server, the ETA download time for a 20mb file was HOURS. Something is clearly wrong , and restarting the internet modem was not helping or changing the results. After multiple talks to Belong staff, whom most could not understand the problem, one finally advised to reset the NBN box – this immediately solved the problem, however, this problem still occurs at random times – usually during the evening (but not to the extent that it did in the beginning – but there are noticeable differences with speed. Resetting the NBN box no longer makes a difference). We personally believe that this is purposely done – rather than ‘throttle’ the speed during the evening (which is common with companies like Optus cable due to congestion) – they appear to throttle outside connections, but keep Telstra connections working fast (which makes you as a user, misinformed, and cheated really). To the blind eye you would think your internet speed is amazing and fast, but in the real world, when browsing any website which is not hosted by Telstra , you are getting a different, slower speed. Customer service: we called the ’24/7′ customer service line a few times. Depending on the time of day, it can be hard for someone to answer. The people who answer the calls appear to be Australian, in Australia – the problem is that they are not very experienced or technical – this doesn’t help at all. Two of the representatives gave wrong information about what the amber/green lights on the NBN box mean. They appear to be ‘down to earth’ and are different from the typical customer service reps, from the likes of Optus – but this is only to comfort the user. When explaining the problem described above to one of the customer service representatives, his response was “So are you paying for Optus to give you fast speeds?”, and various other stupid replies. It was evident that he, and others from the Belong customer service team, are not experienced at all. A problem was solved when the representative finally transferred me to the Philippines call center (which he said was the ‘NBN team’) – who actually is technically experienced. We are very familiar with all the devices on our network, aswell as the speeds they receive on average using our Netgear router. Signing up to NBN, we received a ‘Sagemcom’ f@st branded modem (Sagemcom’ NBN modems are provided by many ISP’s such as Belong, Optus & Telstra for NBN) – so we plugged it into the new NBN box and off we go. Our RK3188 android dongle had full WiFi reception, but the speed was so slow (1.5mbps), while other devices on the network (such as laptops and phones) were getting approx 21mbps. This was really strange, so we tried to make some configuration changes, including; changing the WiFi channel, changing WiFi width 20 40, resetting the NBN box & resetting the router we gave up. The highest speed we got it too was 3.5mbps. It was impossible for there to be an ‘incompatibility’ issue as the android dongle uses the wireless N network which is fully compatible with the Sagemcom router, and this is what most devices in people’s homes use. After switching the router to a Netgear branded one, the speed literally went from approx 3mbps to 16mbps instantly. This is one example, of many, which we have seen &/or experienced when it comes to modems/routers. The internet modem/router that is provided by ISP’s (internet service providers) is always of low quality. They are not designed for streaming, rather to get you online with simple internet use such as web browsing. We always praise the NETGEAR brand, and have now decided to stock them ourselves. You can find them by clicking here. Buffering can be caused for different reasons. We first want to mention this cool tip, that a lot of people don’t know about. With some streams, the system will purposely buffer before playing the video. This is so it can load up a few minutes of the video in advance before playing. This tactic is so that the system ensures that the video will never stop or disrupt your viewing experience. BUT you can bypass this feature. If you have a good internet connection, you don’t really need to utilize this feature, so when you click on a video and find it to buffer before playing, simply click the PLAY button on your remote control, by doing that, it will immediately stop buffering and play the video straight away. Most stock remotes that come with these boxes do have a play button, but some do not. If yours does not, you will need to purchase an aftermarket controller from our store (we recommend them either way as they have more features and will make your experience much more enjoyable). HOWEVER, if the video stops to buffer DURING PLAYBACK, then please read on: First step is to check the speed of your internet connection. You can do this by going to www.speedtest.net, we recommend aMINIMUM speed of more than 7mbps for SD streams, and atleast 12mbps for HD streams. If your speeds are below these recommended minimums, then you should expect buffering issues. The MINIMUM connection in Australia for streaming is ADSL2+ (NOT standard ADSL). We recommend switching Internet Service Providers if you have ADSL2+ but are getting low speeds (in our past experience with some customers, some of the cheaper ISP’s such as DoDo and BELONG had slower speeds than ISP’s such as iiNet). Alternatively you can upgrade your connection. For example, if you have ADSL2+, check if there is CABLE BROADBAND available in your area, if not, check if the NBN is available in your area. These are faster internet connections (some customers think “unlimited” means the best internet, but that’s not true at all. We also recommend using an Ethernet cable rather than WiFi if you have a weak internet connection, for a better experience. (if you choose to use Ethernet, then you need to go back to the Android settings, and DISABLE WiFi, then ENABLE Ethernet, otherwise even if you plug the ethernet cable to the box, the box will still use WiFi). Another reason some video streams may buffer is due to the host of the stream. (outside of your control). For example, some apps that search the web for streams will give you a list of ‘hosts’ to choose from, in different resoultions such as SD HD 720P 1080P. Some hosts are better than others, infact, some HD 720P hosts stream FASTER than SD hosts. If you see a host that says “GVIDEO”, then please choose it – this is the most reliable host. It is more of a trial and error to find out which hosts are the best and most reliable. If one is not working well, simply move on to the next host. If you have ADSL2+ then you should not be trying to stream anything higher than 720P – this will ensure you will have no buffering at all. If you continue to have issues, please restart your internet router/modem (this does wonders) and can make your internet run faster. Simply pull out the power cable for your internet router/modem, wait 1 minute, then plug it back in. Once you plug it back into the power, you will not have internet straight away – you need to wait a further 5 minutes before your internet is up and running again. So don’t try to stream anything until 5minutes later. Another reason why buffering can occur is due to your internet dropping out/unstable connection. This is very hard to notice to the blind eye, as normal web browsing, facebook etc will still work fine on all your devices, and YouTube will still work fine on all your devices (this will give you the assumption that your internet is fine but the box is not working). This issue can only be noticed if you are trying to stream from a third party source. One way to see this issue for yourself, is, if you go to www.speedtest.net, and do an internet speed test, you will see that your download speed will go up then down then up again, then down again (not one stable CONSISTENT speed), this indicates a connection/drop out issue with your internet. All you need to do is call your ISP, who can check and confirm if you have a drop out issue OVER THE PHONE (for free), and depending on who your ISP is, they usually fix it for free. There are 2 reasons for drop out issues, the most common is a faulty internet router/modem, and the second is a LINE issue. At DroidWorld, we have had our router replaced by Optus 3 times in the last 2 years, as it was deemed faulty on 3 separate occasions. On all 3 occasions Optus sent their tech and tested our Line and replaced our router for a brand new one absolutely free. Though smaller ISP’s may or may not replace it for free, you will need to check with them. We were having buffering issues on a 100mbps cable connection (which was resolved when we got the new router). It is best to buy your own NETGEAR branded router/modem. The internet modem/router which your Internet Service Provider gives you is NOT DESIGNED FOR STREAMING, and of low quality. Buying a proper modem/router will do wonders for you. We now stock our favourite NETGEAR models in our online store – feel free to check them out. Please note, all of the above information regarding buffering is mainly referring to ON-DEMAND VIDEOS. If you are having buffering issues with LIVE TV CHANNELS, some of the above information will still be applicable. But, the other factor which comes into play for LIVE TV CHANNELS, is where the stream is hosted, for example, if an Arabic Channel is coming from a Middle Eastern server, then, sometimes even if you have a good internet connection speed, it can still buffer, depending on the quality of their server, how many people are watching at the same time etc. Though most channels appear to play well really well, especially the USA, UK, Greek and Turkish channels. But it is not uncommon for some channels from other countries to occasionally have a buffering issue. Please ensure you have connected the HDMI cable in the device with the other end into the TV. You also need to check if you have selected the correct source for the HDMI input on your TV. (ie; put the correct channel on your TV HDMI 1 or HDMI 2 etc). If you are still experiencing difficulties, please try to use a different HDMI cable, as your HDMI cable may be faulty. If still no picture, Please test the device on a different TV or computer monitor to see if the same issue is occurring there. Finally, contact our support team for further troubleshooting assistance. After you install the main package from the supermax wizard, please wait a few minutes while it does all the automatic addon updates. Once its done, you will notice that the menu options have changed. Click on the new ‘update’ menu, you will then get a new screen pop up saying ‘welcome to the supermax wizard’. Click on ‘country layouts’ (the button directly next to “install package”), then highlight ‘greek option pack’ (example), then press the red install button. It will ask you to reboot the device once it completes the installation. The next time you launch the media center, you need to wait a minute or so. You will see some small yellow text on your screen which says something along the lines of “building menu” or “writing menu” or “building shortcuts”. There will be a percentage mark next to it, once it reaches 100%, the page will ‘refresh’, and the new greek menu will appear. Inside the new greek menu , you will find ‘supermax greek’ as the first option, which is the app that provides all the live working greek channels, aswell as other dedicated greek content for easy access. This is the same procedure for installing any other country pack. Country packs in the supermax wizard will add a new menu selection with that countries specific content. To fix this, you need to make an adjustment in the android settings of your box. Generally the android boxes will be set to ‘auto detect’ the HDMI resolution of your TV – but sometimes the selection may be incorrect and will cause this issue (mainly on android tv boxes which are using the AMlogic chipset, such as S805, S812, S905 etc) – it’s actually a software bug in KODI. In order to rectify the issue, you need to go to the android homescreen (outside of the media center). Then open the android settings. Inside the android settings, there is a ‘display’ option. Different model boxes may have different ways of reaching the ‘display’ option, but generally it is easy to find. On some boxes you need to go to the “all apps” section, and then find and click on “SettingsMBOX” (the “display” settings are here). Once you are inside the ‘display’ menu, you will find something along the lines of ‘HDMI Auto detect’ enabled. Please DISABLE this option. Once disabled, one of the options below will allow you to manually select a resolution (usually called “HDMI Output Mode”). If it is currently set to 720P60hz, please change it to 720P50hz. If it does not give you an option for 720P50hz, but gives you an option for 1080P60hz, please set it to that. This will instantly resolve the problem. Once you make the change, please go ahead and try to open any video or stream to confirm that the issue has been resolved. For people who are using Kodi on WINDOWS PC and have the issue of Kodi not being fullscreen, then the fix for you is different. What you need to do is press either the “/” key or “\” key on your keyboard, and this will instantly make Kodi full screen and fix the issue. What is the difference between all the boxes ? The difference is mainly in brands, hardware, performance & some features. If you have Apple devices at home and wish to have the ability to “AirPlay” or “Mirror” your apple devices to your TV (such as iPhones and Macbooks) – then you should choose one of the XMEDEX or MINIX branded devices as they come with native support for such functionalities. If you have interest in downloading/installing lots of Games onto the device, then you should choose a device with a higher amount of storage to cater for this. If you are looking for ‘top end’ hardware with high performing processors, then you should choose one of the XMEDEX or MINIX branded devices. These devices usually have some extra features, such as AirPlay support. The XMEDEX range of devices also have the ability to be controlled by your mobile phone. There is a downloadable app for any Android or iPhone device, once installed on your phone, you can then use your phone as a wireless ‘air mouse’, touch pad, keyboard & wireless remote for the XMEDEX devices. If you are looking for a low cost device which will be a perfect ‘all rounder’ without lack in performance (we don’t stock any slow or poorly manufactured boxes) – then you can choose one of the TRONSMART, Beelink or DROIDWORLD range of devices. They can provide you with a premium experience without a premium price tag. (there may be other models/brands not listed here which will be in the DROIDWORLD store shortly > and they will also fit into this category). If your device is powered ON, and you can see an LED light on the box which confirms that your device is powered up, but you are getting ‘no signal’ on your TV – please read on. However, if you cannot see an LED light on the box, this could indicate no power being delivered to the device – you may need to physically press the ON button on the tv box itself (not on the remote), to initiate the start up process. (this is generally the case with MINIX boxes). The first thing to check is the HDMI connection. Ensure that both ends of the HDMI are plugged in all the way into your tv box, with the other end into your TV. Sometimes you may need to apply some pressure for the HDMI cable to securely enter the port (there are cases where the HDMI cable appears to be plugged in, but need a little push to fully connect). You will now need to confirm that you have selected the correct HDMI Source on your TV. Your TV will generally have more than 1 HDMI channel, so if you are not sure which HDMI port you have plugged the box into, you can flick through all the HDMI channels to check if the screen is active on one of them. If your tv box has been sitting idle for a while, it may be in ‘sleep mode’. Try pressing on any button on the remote to wake it up. Another reason this can occur is if a user accidentally changes the screen resolution to something which is not compatible with your TV. For example, if the android settings had HDMI set to ‘auto detect’, but then you changed it to ‘example resolution’, and your TV doesn’t support ‘example resolution’ , you will be faced with a ‘no signal’. The way to get it to work again, is to plug it into a computer monitor (generally better than plugging it into a TV), and then changing the screen resolution back to ‘auto detect’ or back to a compatible resolution for your TV. Feel free to try it on another TV if you do not have a computer monitor on hand. A common error is that people may change the resolution to 4K with a 4K compatible box, and if your TV is not a 4K TV, this will cause the above issue. If your TV is infact 4K compatible, then please note the following: 99% of 4K TV’s only have ONE 4K compatible HDMI port. This is usually HDMI port number 1. For example, your new 4K TV may have 4 HDMI ports labelled HDMI 1, HDMI 2, HDMI 3 & HDMI 4. But 3 out of the 4 HDMI ports are generally NOT 4K compatible. You can refer to your TV’s user manual to confirm. Please switch the HDMI cable into the HDMI port on your TV which is 4K compatible, and this should resolve your issue. If all fails, please unplug the HDMI cable, and instead, use the AV cables (not supplied with all tv boxes). This cable has 1 black 3.5mm connection on one end, and 3 RED YELLOW WHITE RCA cables on the other end. The black 3.5mm connection plugs into the port which is usually labelled as “AV” on tv boxes. While the red yellow white cables plug into the back of your TV. You then need to change the channel on your TV to the AV source. The screen should appear, and then you can factory reset the box via the android settings. Once the reset is complete, you can use the HDMI cable again. Hellenic TV is dead – full stop. The only kodi app which can provide you with all the Greek channels is SuperMax Greek TV. It has all the Live Greek channels including ANT, Alpha, MEGA, MEGA ONE, MEGA COSMOS, EPT 1, EPT 2, EPT 3, Star, SKAI, Sigma, RIK SAT & many more. There is around 100 Greek channels available for live streaming. You must use the SuperMax Greek Kodi addon in order to watch live greek tv in Kodi. In order to get the SuperMax Greek addon, you need to use the ‘SuperMax Wizard’. After you install the addons package from the Wizard, you then need to click on the new ‘update’ menu inside of Kodi. When you click on it, it will launch the supermax wizard directly. Now instead of clicking ‘install package’, click on ‘country layouts’ instead, then select ‘Greek option pack’, then press install. This will install a new Greek menu onto your Kodi main menu screen, this will provide you with easy access to all the latest Greek content, including greek live channels, greek series, greek movies & greek radio. Also note that Greek series and movies are now available and working (not using Hellenic TV) – you must install the latest supermax package for them to work again. The buttons on the front of the remote can be programmed with an IR signal. Ie; you can make the red power button turn on your TV, and the volume keys turn the volume up/down on your TV etc. This allows you to use 1 remote for all your needs. 2) ‘Long press’ the TV Button for 3 seconds, the LED will blink red, then release the TV Button. The LED will stay red, which indicates ‘learning mode’ active. 3) Place your IR TV Remote and the XMEDEX remote head to head, with a 2cm gap, then press on the desired button you would like to program (on the XMEDEX Remote) control. It will then blink red. Now press the button on your IR TV Remote which you would like it to learn. The XMEDEX Remote will now stay red, which indicates it has taken the signal. 4) Press the ‘TV’ button on the XMEDEX Remote for 3 seconds, the Remote will start blinking quickly. This indicates that the learning was successful! Now go ahead and try it out! To switch back to wireless mode, just click the ‘TV’ button. Remember, Red coloured blinks on the remote indicate you are in Infrared mode, whilst Green coloured blinks on the remote indicate you are in wireless mode. If you need further assistance with this – please contact the friendly team at XMEDEX by visiting their website. They can supply you with a PDF instruction guide. If you have a first generation xmedex xtreme or xmedex xtreme plus – you really need to upgrade your firmware from Android KitKat 4.4.4 to Android Lollipop 5.1.1. In the order notes, please write ‘upgrade xmedex firmware and media center’ – we will then give you our return address where you can post your device too (we just need the device, without any cables etc). We will upgrade the firmware for you and return the device to you promptly. If you have accidentally wiped your device or have lost the Kodi XMedia Center, you don’t need to worry. If you insert your username and password when prompted into the supermax wizard, and you see a ‘logging in…’ pop up 3 times but nothing happens (or if you press on supermax wizard but nothing happens) – this means you would have entered an incorrect username or password. In order to rectify the issue, you need to highlight the supermax wizard, then click the letter C on your keyboard, OR the MENU button on your remote (usually 3 horizontal lines ontop of each other). Once you do that, there will be a small pop up menu appear. Then click ‘addon settings’, now you can see your username and password on the screen. You will find the mistake in one of them (case sensitive). So edit them and make sure they’re correct. Once you correct the mistake, then press ‘done’ at the bottom of the screen to save the changes. Now you must turn your box off and back on from the power (for advanced users you can ‘kill’ kodi then launch it again). The next time you open supermax it will log in successfully. If you are not sure what your username and password is, please check your email. You can search your email for ‘supermax’ to bring up all the results. Please note that if you registered at the supermax wizard forum, you would have also received a username/password for the forum. The FORUM username/password is NOT the same and is NOT related to the WIZARD. They are totally separate. You can contact the supermax wizard team via the forum if you need assistance with your username and password. I have pulled up some data from MINIX regarding this issue which appears to be affecting many users. (When you attempt to connect with your peer, the Skype app will crash). What you will need to do is uninstall the pre-installed Skype app on your MINIX. To uninstall skype, click on the ‘settings’ icon on the MINIX home screen. Then press the right arrow key until you reach the ‘other/advanced’ tab (the very last tab). Now you need to click on ‘more settings’. Scroll down and click on ‘apps’, and you should see Skype in the list of apps. Click on it, then click uninstall. The solution is to install fresh, the latest version of Skype from the google play store. So go back to the MINIX home screen, then click on ‘apps’, and you will find “Play Store”. This is the App store for android. In order to access the store, you need to simply sign in using any GMAIL email address (if you dont have one you can create one when prompted). After you sign in, search for Skype, click and install – this should resolve the issue. Please note that MINIX recommends the use of Logitech C Series webcams: ie; C170 or C210 (this does not mean other webcams won’t work, but these ones have been tested and marked as fully compatible).